It seems my stamp set spotlight on Kindness Matter was a hit, so I thought I'd do another one on Chock-ful of Cheer. This is a new holiday set found in the 2012-13 Catalog on page 10. This card was made using the candy cane and "Merry Christmas" stamps from Chock-full of Cheer. The techniques used are sponging and crystal effects. 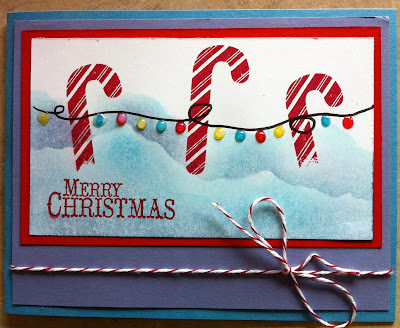 I used Marina Mist, Wysteria Wonder and Cherry Cobbler card stock and ink. The bow is our baker's twine in Cherry Cobbler and the lights were created using Stampin' Write markers in Daffodil Delight, Cherry Cobbler and Marina Mist. To learn more about this card and how to create it, book a workshop by emailing me with your preferred dates. To order supplies to create the card, simply click on the Stampin' Up! logo at the top of the page.